A dust devil the size of a terrestrial tornado towers above the Martian surface in this late springtime afternoon image of Amazonis Planitia. Also captured by the Context Camera on MRO, the length of the shadow indicates that the dust plume reached a height of 20 kilometers (12 miles) above the surface! This height refers to the top of the disconnected dust clouds above the plume; the continuous column of dust reached about half that altitude. Despite its gargantuan height, the plume is only 140 meters (140 yards) in diameter, giving it a snake-like appearance that is twisted by high altitude winds, similar to another dust devil spotted recently in this region. Typical tornadoes on Earth are less than 10 miles tall, while dust devils on our planet seldom reach more than a few hundred yards in height. 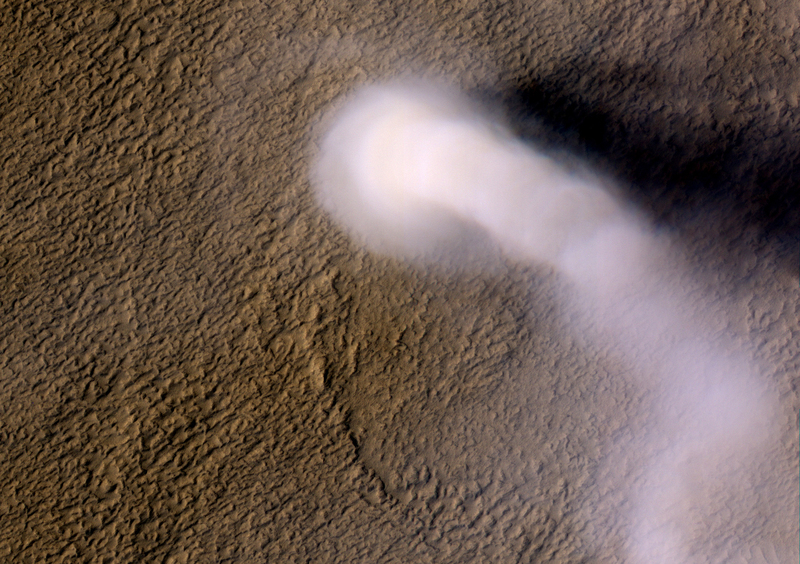 So, why do we classify this plume as a monster dust devil and not a Martian tornado? Dust devils differ from tornadoes in their energy sources. Dust devils are driven by the heat of the surface, absorbed from sunlight and re-radiated to warm the atmosphere. The warm air rises and spins as it contracts, much as a figure skater spins faster as she draws her arms to her sides. Tornadoes have an additional energy source: the heat given off as water vapor condenses into liquid rain. The condensing water vapor produces the visible part of a tornado, called the condensation funnel, which is made up of water droplets. On Mars, there is too little water vapor in the atmosphere to contribute significantly to atmospheric convection on local scales. The cloud that we see in this image is produced by dust particles, not raindrops. The astounding heights of Martian dust devils are made possible because mass of an atmospheric column on Mars is less than 1 percent than that of a column on Earth. Transfer of heat from the surface into this less dense atmosphere can produce more vigorous convection, which will penetrate higher into the Martian atmosphere than its counterparts do on Earth. Now, what would happen if you were caught in its path? Because the density of Mars' atmosphere is so low, even a high velocity dust devil is unlikely to knock you over. However, you might be blasted by any sand or dust particles carried along by the dust devil, which might scratch the visor of your space suit quickly if you were caught outside by this monster! This vortex left behind a bright track as its winds disturbed the dust-covered surface, tracing the path of the dust devil from the northwest towards the southeast. 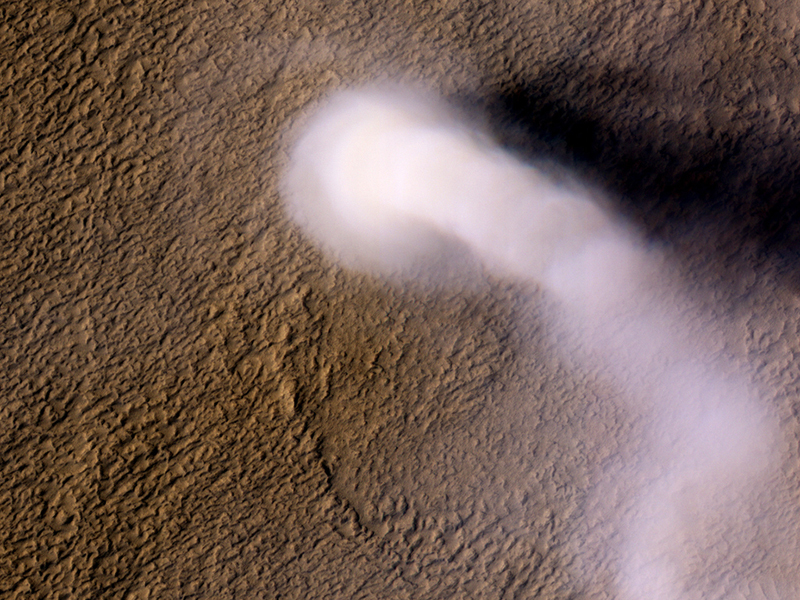 A dust "skirt" twice as wide as the plume itself is seen near the base of the dust devil, but the bright track is the size of the plume and not the skirt. Dozens of smaller dust devils were also spotted in the same Context Camera scene, steadily vacuuming the surface and pumping dust up into the Martian atmosphere. 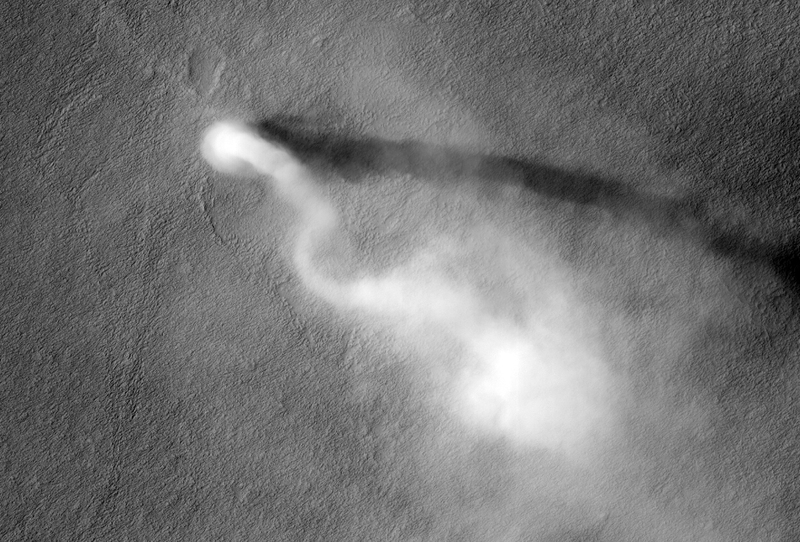 JPL has produced two excellent animations of this dust devil in action.